On designing egg cups: "Eggs and Egg-cups", by Paolo Frello for Dolce Vita Design. On ‘The Birth of an Egg Cup’, 1946 exposition to promote British Industrial Design. Fernando Pessoa's reflexions on the essence of marketing and egg cups: "A essência do comércio", in Portuguese. 'Le Coquetier Ivre / Der betrunkene Eierbecher', made by Hans Arp in 1926. 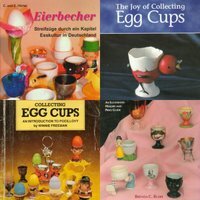 'Egg cup' and 'Eierbecher' entries in Wikipedia. Our other blog, Una huevera al día, in Spanish. "Onori e blog sul portauovo", by Cristina Nadoti, for La Repubblica; it includes comments on our other blog and it's written in Italian. María José Fuster's 'Las hueveras también tienen su historia', in Spanish. A brief "History of the Egg Cup" used for the exhibition of Mr. & Mrs. Gordon Stuart's collection at the Poway Historical and Memorial Society in Poway (California). 'Whistling Cups - For Eggs N' Milk', article on whistling egg and milk cups by Pat Stott-Prince. "The Joy of Egg Cups", by Rbirdies, in The GPSA Gazette. "The World is an Eggcup", by Irving Scott, for ‘Antiques Diary’ magazine. 'Pocillovy' entry: a weird word according to World Wide Words. 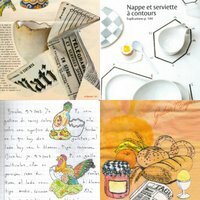 "Le coquetier à la table des grands", article on French collector Alain Desgranges and his collection, in French. 'It’s no yolk', article on Sabine Joyce and her collection, written by Theresa Winslow for The Capital, Annapolis. We've found a number of strange comments on egg cups collecting at the "A-Z of crazy pastimes" section from BBC Wales' Just the job site: they say that people who thought about "collecting eggcups commemorating, say, Prince William’s 18th birthday" should rather "go mainstream", meaning they'll have more fun "collecting eggcups full stop. Or eggcups of a particular colour. Or eggcups manufactured in a certain country. Something like that". The main problem being that all this is discussed under the "Zzzzz" subsection. Read it with your own eyes here. And see how they call the Egg-Cup Collectors' Club a "bizarre collection society" here. Sydney's Powerhouse Museum of Science and Design has an important quantity of egg cups in its collection. It is searchable on-line. Worth checking out are, for instance, a 19th Century English egg cruet in Sheffield plate; an Elkington silver plated circular egg cup stand and matching egg cups, produced circa 1870; a pair of whale tooth egg cups; a Curl/Adelaide Potteries Ltd stoneware egg cup in the form of a chicken, produced between 1900 and 1915, and four earthenware buckets from Martin Boyd Pottery, produced in 1963. Chamberlains & Co 1802 egg cup; it belonged to Vice-Admiral Horatio Nelson's breakfast service and is now at the National Maritime Museum, in London (UK). Pickmann 1862 egg cup, at the Palacio Real de Madrid (Spain). Fayence egg cup, 1760-1770, at the Museums of the City of Bamberg (Germany). Here's a 1951 Festival of Britain souvenir copper egg cup bearing an enamelled logo; it was produced to commemorate a festival designed to promote British art, design and industry; it's a property of the Museum of London. 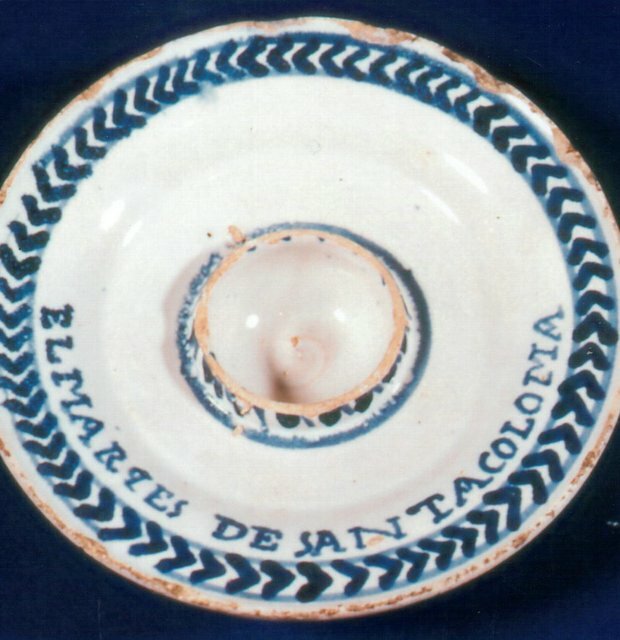 Egg cup marked "El Marqués de Santa Coloma", from the Museu d'Història de Tarragona (Spain). In the Heimatmuseum from Strausberg (in Germany) took place in 2005 a "Osterausstellung" with a lot of interesting egg cups; here's a nice feature concerning it. The Middleton Area Historical Society Museum (in Middleton, Wisconsin) welcomes a whole collection of egg cups, as well as a collection of Depression glass that will probably be of interest for egg cup collectors. Practical information can be found here. 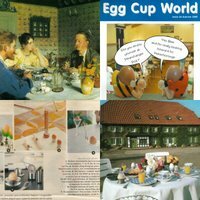 Egg Cup Collectors Club of Great Britain; they publish the magazine "Egg Cup World". Egg Cup International Club's page; the Club has a newsletter called "Egg Cup update". Our favourite collector's site: Barbara Haußmann and Gunnar Galster's collection; they live in Germany and collect egg cups in couples. Ovamaria's site; anonymous "eggcuplady" has been a collector since 1966! Bob Paton's site; he lives in Rochester, Kent (England). Ad Koetsier's site; he lives in The Netherlands. Joëlle and Jean-Claude's site; they live in France and they like classical music. Sheena's Egg Cups' site; she specialises in pieces with a "Royal" connection. Pat Stott's page; she is the author of "The collectors book of Egg cups", a 1993 price guide. Tricia's Eggcup Page; she collects egg cups on-and-off. Judy Becker's profile; she is an Australian pocillovist. Somebody's mother-in-law's collection, as well as her nice shelves. Here's a post from an anonymous French blogger and egg cup collector who believes that egg cups are a French invention. A marvelous collection of Devres pottery egg cups, in a style knwon as "Vieux Rouen", on-line thanks to La Fourmaintrie site. 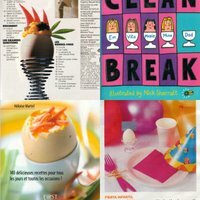 London musician Erin Lang doesn't have a site on her personal collection but wrote a very nice post on TV Resistori called "Music to shop for egg cups by". 'Sonntagsei', a "less is more" egg cup by Thomas Höhnel from Berlin. 'Node' Silicon Egg Cup project, by Ross Nicholls, for The University of New South Wales' Faculty of the Built Environment. D.I.Y. 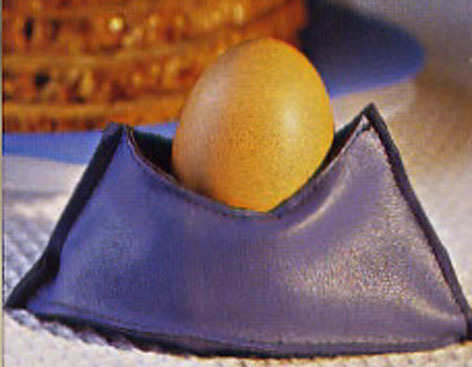 fake leather egg cup; instructions here (in French). Improvised egg cup, by Die Wise Guys. Improvised Yoghurt-egg hybrid, by framboise. Improvised egg cup made using a wet tissue, by jdpilgrim. Improvised egg cup with bottle top, by l'alex. How to make egg cups with toilet paper tubes. Looking for origami egg cups? Different models like this one or this other one can be found here. Plenty of Speedy egg cups in freezer, by Herr Monsterfrosch. Animal egg cups running through wild grass, by Theoretic.Gal. Deconstructed spiral egg cup, by limasign. Mini-librarian having fun with egg cups, from Meribélgica's Fotolog. 'Doing silly things on a cold and rainy afternoon', by Brigit. Herman Munster's egg cup, by dosmokem. Somebody called Tony in an egg cup, by MrStevenson. Eat soft boiled eggs cooked with a kettle. Create an ice lamp with a spiral egg cup. Transform them into place-card holders; do it with a fake rose if you want to. First put artificial grass inside them and then use them as place settings. Decorate them with geometric forms (in French). Give the essential fashion touch to your dolls' house table. Wear them as fake headphones. Use them as fake glasses; this looks like a popular activity. Construct a musical instrument with a pulled apart hard-drive; waltonics did it. 'That Installation With The Eggs'; installation with 350 egg cups, by artist Eddie D.
Calgary Woodturners' site; they are the Calgary International Egg Cup Turning Competition organisers. 'Egg cups for lovers' (Eierbecher für Verliebte) made by Schulhaus Bernarda's pupils (Altdorf, Switzerland). 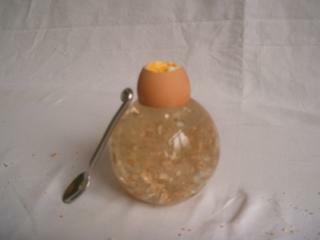 'The Defragmented Egg egg cup' created by Arnaud Dubois. PC game 'La Poule aux Oeufs d'Or': the winner needs the hen to give him as many eggs as egg cups he sees. 'The Price is Right', Daphna Levin's short-film featuring egg cup scenes. Architectural projects for egg cups from the University of Applied Sciences of Cologne's Faculty of Architecture. Gathie Falk's 'Picnic with Clock and Egg Cups' (1976). How to say 'egg cup' in Flemish Sign Language. Birdbrain, the animated egg cup, by Cleo Hehn ; check 'The Birdbrain Show' or 'Birdbrain's Fever Dream' and discover its incredible adventures. A still life painting with an "American shape" double egg cup, by Erik Leighton Koeppel. A ring that looks like an egg cup! You can't believe it? Look at it again! Do you miss your egg cup collection when you are away from home? Maybe you should reach Silverton (Oregon), where you will find a Bed & Breakfast offering two suites decorated with egg cups. At least that's what it's said here. Blake, Brenda C., "Egg Cups: An Illustrated History and Price Guide", The Glass Press, Marietta, Ohio, 1995; extremely useful. Hashemi, Javad, "The Joy of Collecting Egg Cups", Arian Publications, Solihull, 1998. Hörter, C. and E., "Eierbecher", Berta-Verlag, Weilheim, 2004; this is an absolute must have, especially if you're interested in German egg cups. 10) Who's afraid of collecting egg cups? Did Virginia Woolf collect egg cups? We believe she did. Not only do egg cups appear recurrently in her writings, but, moreover, a document known as "Notes on collecting egg cups" is to be found in the Frances Hopper's documents concerning Woolf at Smith College's Mortimer Rare Book Room. In the notes we find this enigmatic sentence: "This little Egg Cup from Harriet's coalport is where it all began - and with it goes this little silver egg spoon marked C for Comstock and this little decapitator from London". Harriet Marian (Minny) Thackeray Stephen was the name of the first wife of Woolf's father. The title of the notes obliges us to believe that the "all" in "all began" refers to collecting egg cups. 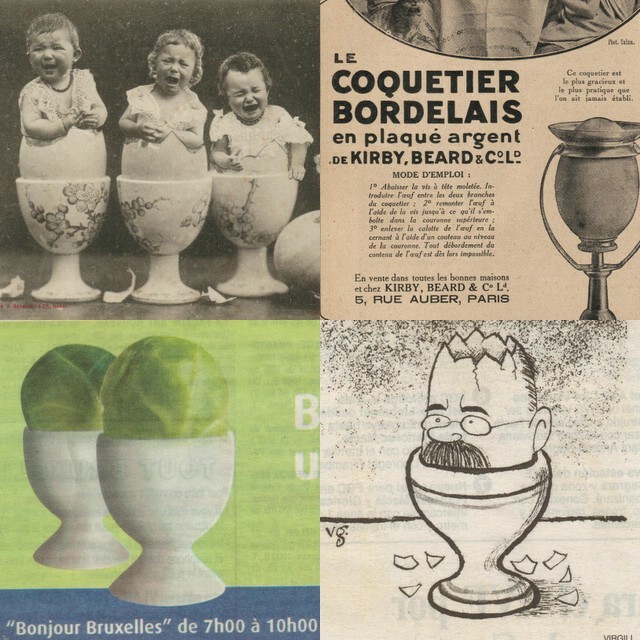 Collage 1: A) from a French postcard marked "Phototypie A. Bergeret, Nancy"; there are actually two of the same style, with crying and with smiling children (a modern version of this postcard can be seen here); B) from a French ad for "Le coquetier bordelais", an egg cup specially designed to avoid spilling; C) from a Belgian ad for "Bonjour Bruxelles" radio programme on BXL FM radio, published in Vlan, july 2005; D) from Catalan politician Carod Rovira caricture, made by Virgili, published in El País, 10th February 2004. Collage 2: A) from a 1893 painting by Danish painter Peter Severin Kroyer, part of The Hirschsprung Collection in Copenhagen; B) from Egg Cup World issue 44's cover, it was the Autumn 2005 issue; C) from a small articule on modern egg cups published in Spanish El Mundo's Magazine; D) from an official photo for Herz-Hotel Gut Höing, in Unna (Germany). 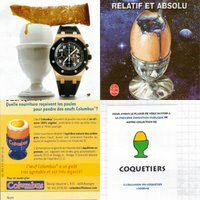 Collage 3: A) from a Spanish ad for Audemars Piguet watches; B) from Bernard Werber's "L'encyclopédie du savoir relatif et absolu", published by Albin Michel/Le Livre de Poche; C) virual egg cup created by Belgian Columbus egg producer for advertising purposes; D) part of the flyer edited for the first exhibition of María José Fuster's egg cups. 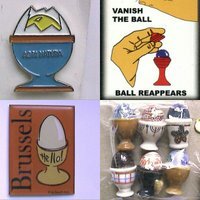 Collage 4: A) Agri Natura's pin, in the shape of an egg on an egg cup; B) taken from a Royal Magic's Ball Vases's box, "Remove the ball, vanish the ball, ball reappears"; C) Brussel's souvenir magnet, with a "Hello!" egg cup; D) a mini collection of ultra small egg cups. Collage 5: A) 19th century French "Cocotte façon journal" as shown in the article "La ronde des coquetiers", written by Alice Dailly, in "Art & Décoration", April/May 2000, p. 141; B) retro plastic egg cups look like the most important modern trend; Gael Maison suggests everybody should get theirs from second hand stores in its 06/0081 issue, published September 2006 (see p. 140 and 144); C) sample of the notebooks where the collector keeps track of all new egg cups, with a couple of egg cup's sketches; D) German paper napkin featuring an egg cup. 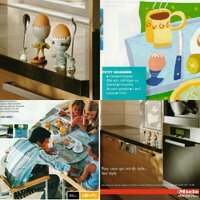 Collage 6: A) detail from an advert for Miele's kitchens where we see a kitchen with two made in China plastic egg cups and the slogan "For those who have syle... their style", created for the Belgian market; B) taken from an article that declares it's a good idea to start the week with a soft-boiled egg, Mode & Travaux n° 1203, February 2001; C) a happy family eating soft boiled eggs - they appear in an advert for Somfy's electric door openers; D) a bigger picture from the Miele's kitchen advert. Collage 7: A) a spiral egg cup with a spectacular egg, from Madame magazine, published at the beginning of the 90s; B) detail from the cover of Jacqueline's Wilson "Clean break", a children book illustrated by Nick Sharratt and published by Corgi Yearling (2005); C) detail from the cover of "Le petit livre des recettes aux oeufs" by Héloise Martel, First Editions (2004); D) is it a good idea to use glass egg cups at children's parties? a Spanish magazine thinks so, but maybe only if you use the pictured Vinçon model (Micasa, n° 59, year V, p. 188). 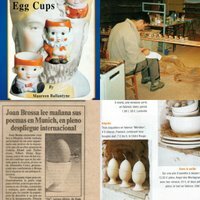 Collage 8: A) detail from the cover of the book "Over 1.000 illustrated egg cups", by Maureen Ballantyne; B) a potter creating egg cups at the Abió e Hijos pottery at Bandaliés (Huesca); C) an article from La Vanguardia with a picture of Joan Brossa's "Ou" visual poem, with a white egg cup (1988); D) similar white egg cups, with candles, as pictured for Campagne Décoration, n° 26, March-April 2005. Collage 9: A) from the cover of "Eierbecher", already mentioned; B) from the back cover of "The Joy of Collecting Egg Cups", already mentioned; C) from the cover of "Collecting egg cups: An introduction to pocillovy by Winnie Freeman (Wise Books, Reigate); D) from the cover of "Egg cups: An Illustrated History and Price Guide", already mentioned.